A giant, full-tower PC is the best choice to enjoy the ultimate experience, especially for gaming needs, where one can have a lot of options such as high-end graphics cards, multiple storage devices, and other stuff. However, many people occasionally do gaming and are fond of playing games having low requirements. Also, the other applications of computers do not require such tremendous hardware such as browsing, basic video editing etc. This is where comes the concept of low-profile computers which not only consume less space on your desk but also have a lot of lower power requirements than a fully equipped gaming PC. Certainly, we cannot fit massive components, especially the humongous graphics card in our low-profile PCs. To fill this particular need, manufacturers have been designing low-profile graphics card having half height than a normal one though still providing adequate graphical performance. Nvidia GTX 1050 TI is a mid-end graphics card which is favored by a lot of people and it is probably one of the most sought out GPUs in the 10 series lineup. This particular design of Zotac packs a beefy enough heat-sink to handle the heat of GPU while being thin enough to fit in the SFF computer cases. It has a boost clock of 1392MHz, equipped with a 128-bit memory bus and a 4GB GDDR5 memory. Certainly, this graphics card cannot max-out the latest stunning AAA titles but almost all the games can be played on 1080p resolution with medium settings. However, for anything above 1080p resolution, this graphics card is not suitable and the lag-free gaming experience cannot be achieved. Zotac has locked the minimum fan speeds for the graphics card at a 45% minimum which creates noise even when idle. Since this is a low-profile GPU, the fans are also smaller than high-profile graphics cards, which results in high-frequency noise which can be a deal breaker for people sensitive about acoustics. The graphics card hosts 1 x DP port, 1 x HDMI port, and 1 x DVI port while consumes around 75 watts at max. Zotac also enriches the market with a “mini” edition of the same model which features full-height PCB but comes with a single slot bracket. This specific model, however, does not provide the single slot bracket and cannot be used in cases with only single slot space available. However, the half-height bracket is included in the accessories of the GPU. In benchmarks, we found that this graphics card was as good as the standard GTX 1050 Ti though the temperature was a bit higher, especially in comparison to standard dual-fan models, making it the perfect choice for almost anyone. AMD RX 560 is also a mid-end graphics card targeted towards mediocre level gamers rivaling the Nvidia’s GTX 1050 TI. It is based on 14nm lithography (2nm smaller than that of Nvidia’s 10 series) which is very suitable for efficient working leading to lower Thermal Design Power (TDP) than the previous generations. 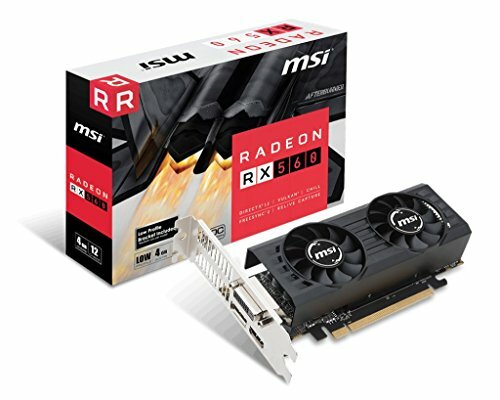 MSI’s low-profile edition of RX 560 has a boost clock of 1196MHz, equipped with a 4GB GDDR5 memory buffer and a 128-bit memory bus. 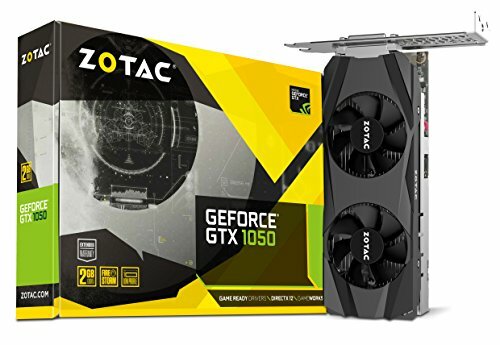 This graphics card has slightly lower performance than its Nvidia Counterpart, GTX 1050 TI, but also comes with a lower price tag which can be a good sacrifice for a lot of people. This GPU is not suitable for gaming above 1080p resolutions and a blend of low and medium settings are recommended. MSI’s low-profile edition has slightly high thermals despite being fitted with a dual fan design. Contrary to Nvidia, RX 560 graphics cards can be used in pairs with crossfire technology. This GPU provides 1 x DP port, 1 x HDMI port, and 1 x DVI port and have a TDP of 60-watts. FreeSync is also a major advantage of using an AMD product which can ensure a stutter-free experience while G-Sync, and Nvidia implementation, is costly and not suitable for low to mid-end gamers. Accessories of the graphics card also include a half-height bracket though it is still a dual slot bracket. This graphics card provided us with very similar results to GTX 1050 Ti, especially in DirectX 12 and Vulcan titles as AMD graphics cards are optimized greatly for these APIs. The temperature of the graphics card stayed under the limit as MSI has used a beefy heat-sink for this tiny graphics card. This graphics card is a great alternative to Nvidia GeForce GTX 1050 Ti with almost same performance while providing a different adaptive sync technology. So, if you do not have enough money or GTX 1050 Ti is not available, then this will be your safest bet. Nvidia GTX 1050 is considered the younger brother of GTX 1050 TI with somewhat lowered specifications such as 640 shader processing units instead of 768 on the TI model. However, it is equally good in terms of memory performance as those specifications are identical to those of 1050 TI through the memory buffer is reduced to half i.e. 2GB. Gigabyte’s low-profile model has a boost clock of 1506MHz. This GPU is targeted towards people who play competitive titles which have good enough graphics but not much demanding so that a wide range of people can enjoy them, such as CS-GO, R6 Seige, Fortnite etc. The design of the graphics card feels normal with not much bells and whistles as it is supposed to be a low-end graphics card. Though the build quality of the GPU can be improved by a lot, especially the fan quality seems to be a consistent issue for a lot of people. The fan becomes a bit noisy after a few months though it won’t completely stop working leading to a thermal throttle. This graphics card includes 1 x DP port, 2 x HDMI port and 1 x DVI port and under high loads, it can consume around 75-watts. A good feature to compensate for this issue is that the GPU’s fan can be completely stopped while it is below a specific threshold. This threshold can also be customized by using the software utility provided by gigabyte named as XTREME Engine Utility. This graphics can also support four displays due to rich outputs on the back. This graphics card gave a tough competition to AMD RX 560. The FPS figures were slightly higher in DirectX 11 titles while in DirectX 12 and Vulcan based titles GTX 1050 lagged behind. We will only recommend this graphics card if you own a GSync display in which case AMD RX 560 would be a waste and do not have enough money to buy a GTX 1050 Ti. AMD RX 550 is a cut-down version of RX 560, as expected comes with a lower price tag and provides lower performance. Unlike the Nvidia’s GT 1030, this graphics card is coupled with a 128-bit memory bus and also with the same amount of GDDR5 memory buffer as that found on RX 560 and GTX 1050 TI. It is still debatable though that this luxurious amount of memory buffer is not very helpful, for such a low-end product, in gaming but in certain applications, it still has its advantages. MSI has used two fans on this low-profile design and a heat-sink big enough to dissipate the heat efficiently. Also, a single-slot design is being used in combination with two display outputs. 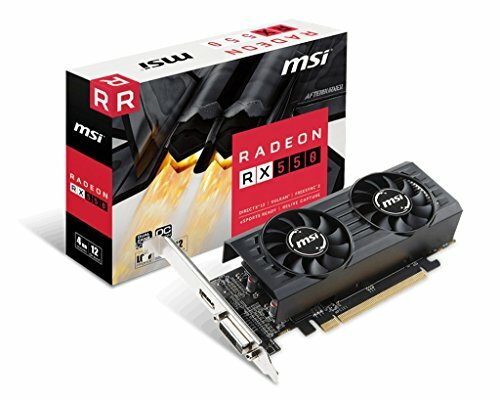 RX 550 is among the most attractive products in the low-end graphics card market due to its low price and still having suitable performance while providing rich features. MSI has used military-class-4 components on this graphics which ensure great life expectancy. This graphics card provides an HDMI port and a DVI port for display and consumes around 50-watts at full load. A half-height bracket is also included in the accessories for usage with SFF based systems. While it requires a costly G-Sync monitor to take advantage of G-Sync technology on the Nvidia’s side, AMD users can enjoy the stutter-free experience with the FreeSync technology as long as the GPU is providing enough frames per second. In certain scenarios, RX 550 is also at an advantage with Vulcan based games where Vulcan is an Application Programming Interface (API) and AMD shines in this particular API comparing to Nvidia. This graphics card gave similar results to GT 1030 in gaming benchmarks which is why we will not recommend this graphics card for any serious gaming session. However, for low-end games, browsing and watching UHD videos, it is a sound choice. The temperature of the graphics card was way under the limit as it is not a power-hungry graphics card. Nvidia GT 1030 is the lowest end graphics card of the 10 series and it is targeted towards people with very basic graphical needs such as watching a video, browsing and the low-end games. It is not suitable for any game with mediocre graphics and will cause a lot of lag and stutter, though the resolution and settings can be adjusted to allow the user to enjoy old games at decent frame-rates. A resolution of 720p is recommended to use with this graphics card and anything above will be a hassle. Older games i.e. games before 2010 can still be enjoyed at rich 1080p resolution with suitable frames per second. 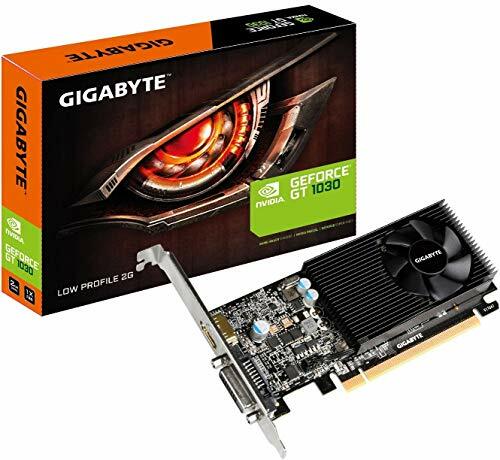 Gigabyte’s low-profile design has a basic heat-sink and a small fan since the TDP of the GPU is not very high. It is equipped with a 64-bit memory bus width and a 2GB frame buffer along with 384 shader processing units. It operates at a 1506MHz clock rate which is a bit higher than the stock clock speed of a GT 1030. The design of the graphics card is too outdated with a small black heat-sink and an ugly fan. This saves a lot of manufacturing cost though which is why this graphics card is very cheap and an attractive product for people who pay less attention to the aesthetics and more about the actual features. There is only 1 x HDMI port and 1 x DVI port for output and this graphics card can consume around 20-watts at max which shows that it is very power efficient. 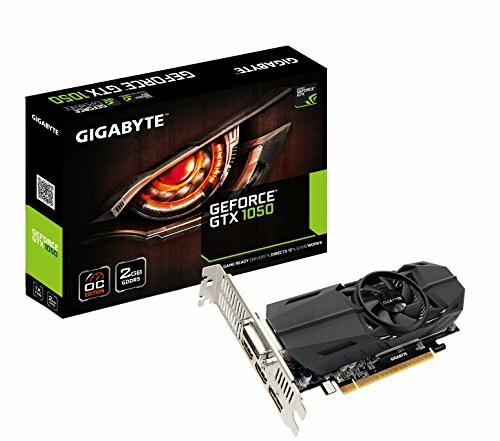 Another advantage of this graphics card is that it comes with a single slot design which is very handy for some people having only a single slot space in their cases. Since this is a graphics card from a recent generation, its architecture provides certain advantages which might appeal to a consumer such as hardware acceleration for latest video codecs. The gaming benchmarks of this graphics card were a little disappointing as there was a lot of stuttering in the latest titles even at lowered resolutions though it proved excellent during the UHD video playbacks. This graphics card should only be considered if you are fond of browsing and watching videos than games. For anyone, who wants to enjoy the mind-blowing visuals of a game, should avoid this graphics card.